Kim Hyun Jung is a breath of fresh air in the traditional Korean art scene. Few could picture a woman dressed in Korea’s traditional dress, or hanbok, eating junk food or riding a motorcycle. These incongruous scenes unfold day in and day out in Kim’s drawings. 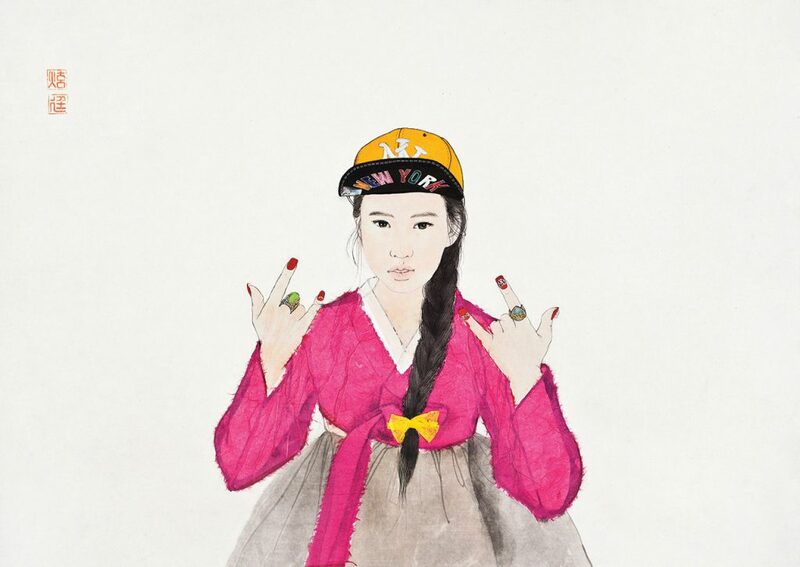 She humorously defies convention by placing women clad in hanbok in absurdly contemporary situations. These daring rebellions, far from offensive, are quite charming. The artist’s quirky, pop art-esque style brings a smile to the face of the viewer. A pop star in the Korean art scene, Kim breaks records wherever she exhibits her work while staying true to her 21st century femininity. Her 2014 solo exhibition at the Insa Art Center, “Feign Olympics,” drew over 24,000 people in just ten days, an attendance record for the venue. 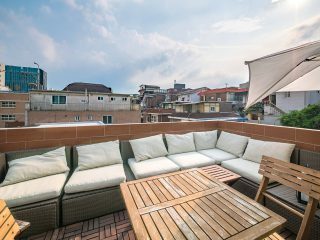 The following year, she was the youngest artist featured in a special exhibit of Korean paintings at the Museum of Modern and Contemporary Art of Korea. In 2016, she was invited by the Metropolitan Museum of Art in New York for a solo exhibition. Earlier this year, she held another local exhibition, “Feign Amusement Park,” which drew over 67,000 people. This painful time of depression inspired her signature drawing series, “Naesoong,” which translates to “Feign.” Naesoong is a deceptive attitude: docile on the outside, but sly and cunning inside. She initially began the series to capture observations of people in her life who exhibited this behavior. As she drew, however, she realized that her observations reflected herself. Since then, she has drawn herself wearing the hanbok in a variety of modern life scenarios. The stereotypically ideal woman in hanbok is coy and docile. Not so in Kim’s drawings, however. 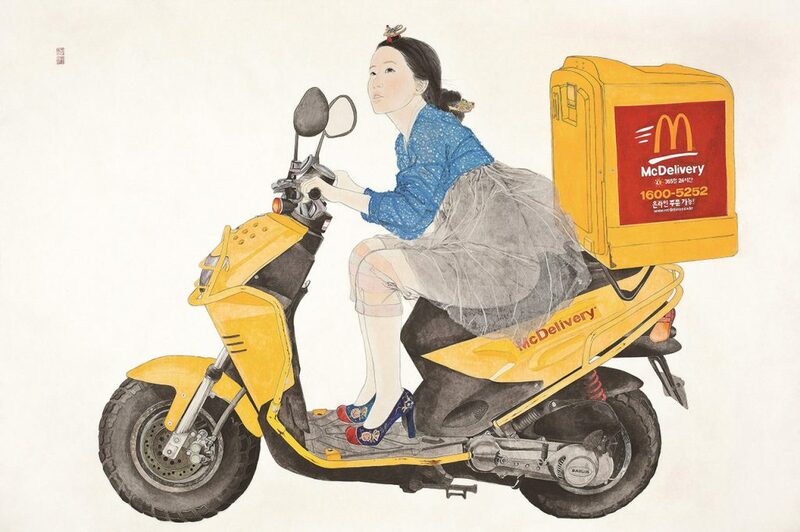 The drawing “Feign: You Move Me,” for example, portrays a woman riding a McDonald’s delivery motorcycle with her skirt running up her knees. In “Feign: Oops,” a woman looks in distress at her ruined designer bag, stained by coffee from a spilt Starbucks cup. Unfortunately, she is eating instant noodles, and so cannot move the bag. Kim is also famous for her social media following. With over 19,000 followers on Instagram, she regularly posts about her art, life and upcoming events. Realizing the importance of communication early, she set herself up to be communicating artist, double majoring in business management. Her unconventional education stemmed from her interest in both the commercial and public aspects of art. “I saw a close relationship between business and art marketing,” she says. “I thought about how to minimize the perceived distance between the public and art, and realized finding humor in daily life and applying it to my work could be a solution. Studying business influenced my work in many ways.” During this time, she adopted the vision of communicating with the public through art. In addition to social media, Kim gives lectures and hosts workshops for corporations and educational institutions. She hopes to eventually start a genre called “social drawing,” in which artists and the public can talk about art through social media, even creating art together. This could be an opportunity to not only collaborate, but also for people to create their own artwork.